So far, testing The Board has been a complicated matter because it involved messing with jhbuild, build dependencies, compilation of a dozen of modules, etc. Those are fine for developers but not really for the people who just want to try the app. Here’s a summary of the progress made on the creation of distro packages for The Board. You have to enable Ubuntu’s Universe repository. There are still a few issues with running The Board in Unity—blurred icon on panel, no status icon, etc. I’ll have to talk with the Unity team to know how The Board can be better integrated with Ubuntu’s new UX. Thanks to the work of Andrew Wafaa, The Board packages are available for openSUSE. Frederic Crozat then integrated Andrew’s packages into the GNOME 3 Live CD. So it’s now easy to try The Board while having a sneak peak on GNOME Shell and other GNOME 3 goodies. As I said before, I’m still unsure on how to nicely integrate the app with GNOME Shell. The use of GTK+ status icon doesn’t really fit GNOME Shell’s UI design. All in all, my hope is that those packages will allow more people to try The Board with minimum hassle. 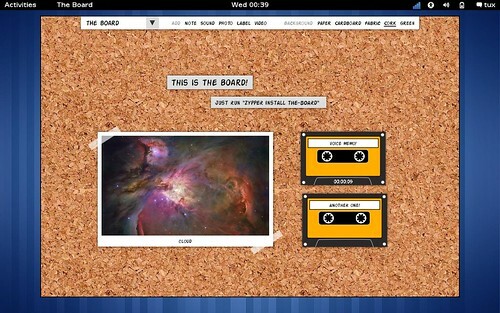 Keep in mind that The Board is still under heavy development and is not ready for end-users. For now, I’m looking forward to getting feedback, bug reports, and patches from insightful early testers and developers! For instance, Luc’s 15 minute review is an excellent example of the kind of feedback I’m looking for.